A spare and haunting, wise and beautiful novel about the endurance of the human spirit and the subtle ways individuals reclaim their humanity in a city ravaged by war. In a city under siege, four people whose lives have been upended are ultimately reminded of what it is to be human. From his window, a musician sees twenty-two of his friends and neighbors waiting in a breadline. Then, in a flash, they are killed by a mortar attack. In an act of defiance, the man picks up his cello and decides to play at the site of the shelling for twenty-two days, honoring their memory. Elsewhere, a young man leaves home to collect drinking water for his family and, in the face of danger, must weigh the value of generosity against selfish survivalism. A third man, older, sets off in search of bread and distraction and instead runs into a long-ago friend who reminds him of the city he thought he had lost, and the man he once was. As both men are drawn into the orbit of cello music, a fourth characteraa young woman, a sniperaholds the fate of the cellist in her hands. As she protects him with her life, her own army prepares to challenge the kind of person she has become. 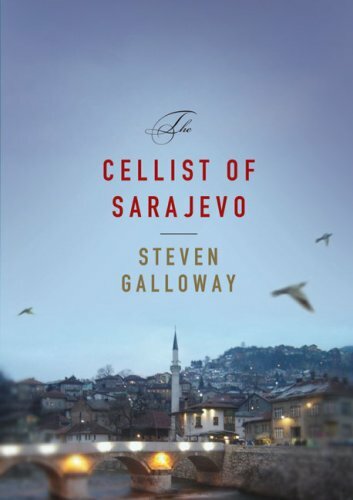 A novel of great intensity and power, and inspired by a true story, "The Cellist of Sarajevo" poignantly explores how war can change oneas definition of humanity, the effect of music on our emotional endurance, and how a romance with the rituals of daily life can itself be a form of resistance.